Get out your binoculars and have a look for Comet Jacques as it moves down the constellation Cygnus. Once every year or two, a comet appears in the sky that is bright enough to be seen with a small telescope or binoculars. Right now, observers anywhere in the Northern Hemisphere can see such a comet. The newfound Comet Jacques, officially known as C/2014 E2, was first discovered earlier this year on March 13 by a team of Brazilian astronomers using the 17.7-inch (0.45-meter) telescope at the Southern Observatory for Near Earth Asteroids Research (SONEAR). The comet was then quite dim, and remained dim for most of the summer. Comet Jacques (named after its principal discoverer, Cristóvão Jacques Lage de Faria) is now moving southward through the constellation Cygnus, making it well placed for observers anywhere in the Northern Hemisphere. It is almost directly overhead, close to the bright star Deneb. To see the comet, you will need at least a pair of binoculars with 7x50 power. 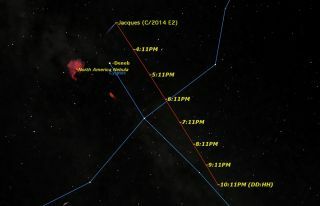 The bright stars of the constellation Cygnus make easy landmarks for locating the comet. Comet Jacques is moving quite rapidly across the sky because it is relatively close to the Earth having made its closest approach to the planet on Aug. 28. It is now retreating both from Earth and from the sun, so the comet will be fading quite rapidly. This week may be the last opportunity for skywatchers to observe it, especially since the moon is getting brighter. What will you see in binoculars or a telescope? The nucleus of the comet will look similar to a bright galaxy. You probably won't see much of a tail, though this should appear in photographs. The comet will pass in front of the Milky Way star fields of Cygnus, and close to several bright nebulas, making many excellent photo opportunities for deep sky photographers. Editor's Note: If you capture an amazing photo of Comet Jacques or any other night sky view and want to share it for a possible photo story or gallery, send images and comments to managing editor Tariq Malik at: spacephotos@space.com.